The new JeffJack Apartments in the West Loop are nearly two-thirds leased after only a few months on the market. JeffJack is continuing to offer a month’s free rent on select one- and two-bedroom apartments. I stopped by yesterday for a look at the 15th floor amenities at JeffJack, which were complete except for a few finishing touches. 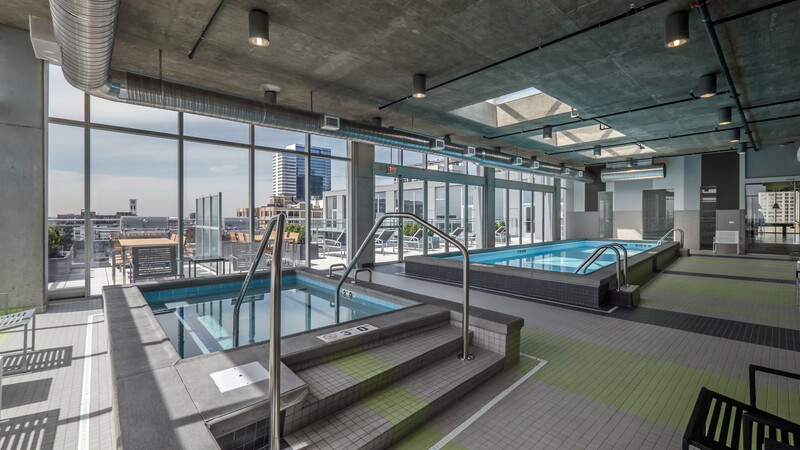 JeffJack has a skylit indoor pool and whirlpool with floor-to-ceiling accordion windows that open the space to the outdoors. The adjacent sundeck has multiple grilling areas. The sundeck overlooks a green roof and private dog run atop the parking garage. JeffJack also has a business center with a conference room, and a media room. JeffJack is a full-amenity, pet-friendly community. Floor plans are available online, and the JeffJack leasing office is open daily at 601 W Jackson. View the full article and see more images here. Original article published by Joe Zekas of YoChicago.